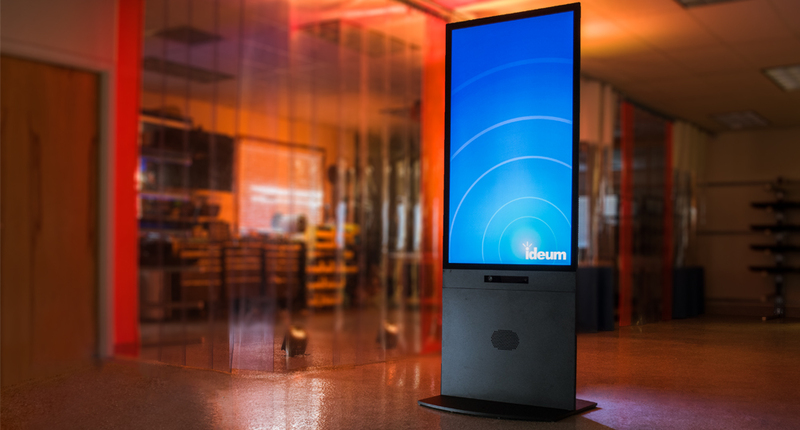 Ideum tests out an immersive video wall with panoramic images. Recently, a client came to us with a particularly challenging concept: build an immersive video wall so enveloping that it feels like a virtual reality experience. Challenge accepted! We were thrilled at the prospect of designing and developing such an installation, and excited about the types of experiences it could lead to. In just the last three weeks, we’ve taken this from concept to reality. Developed with 20 vertically-hung Christie 55” monitors, this immersive video wall goes nearly floor-to-ceiling and is designed with a deep curve that completely fills your peripheral vision when you enter into the space. The wall is indeed enveloping: 10,800 pixels wide by 3,840 pixels tall. We are using Christie's Pandora's Box player and widget designer software to create a series of templates that our client will use to show a variety of images and video. To test the system out, we used some of the high-resolution panoramic images we shot in Peru in 2015. 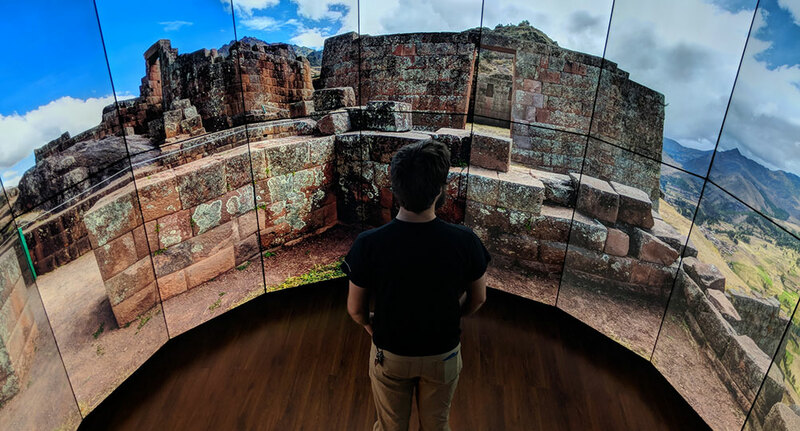 As part of the Smithsonian National Museum of the American Indian (NMAI) Inka Road Project, these panoramic images show scenes in Cusco and in Pisac. 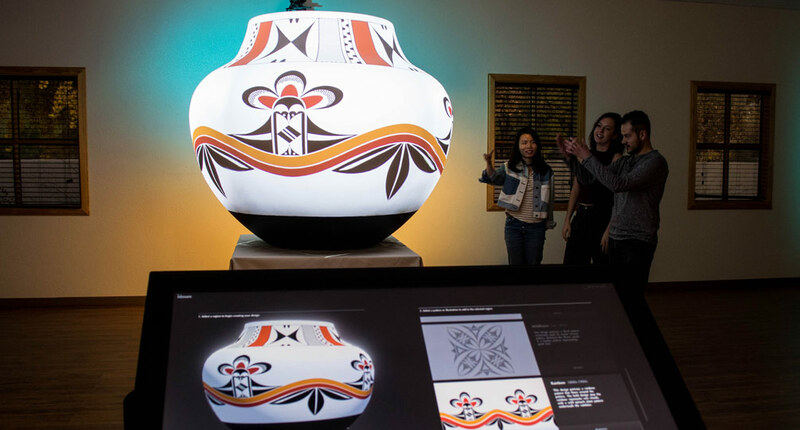 These 360-degree images were used as part of the Inka Road touch table exhibit and they appeared on the [NMAI Inka Road website](). (You can see web versions of all of the Peru panoramic images on Ideum’s archive site.) With 10,000+ pixel wide panoramas on display, stepping inside this truly immersive video wall evokes a unique and powerful feel of place. If you are in New Mexico, you can see our immersive video wall for yourself at our Winter 2018 studio party on Monday, February 12. We look forward to getting more feedback as we finalize the software elements of this innovative experience. If you are interested in attending our gathering, please feel free to contact us and we will provide the details. The video wall will be broken down on February 13 and packed to be reinstalled in our client’s facility. We hope to provide additional technical details and more about the types of experiences it enables in a future article on our website.